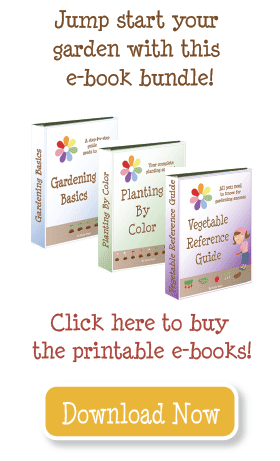 Note: This post discusses planning and building your square foot garden beds. 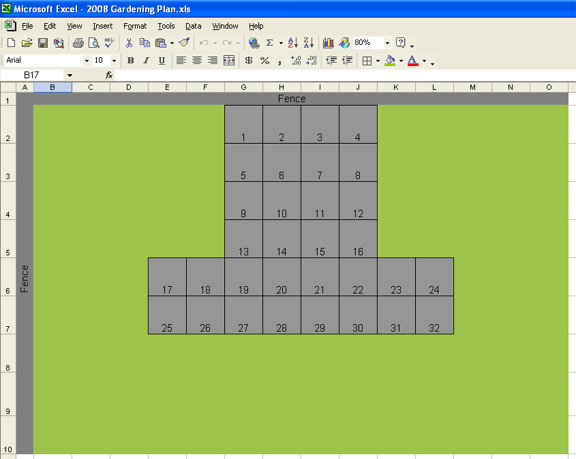 If your beds are already constructed, go here for information about planning your square foot gardening layout. Sunlight–most plants need 8-12 hours of direct sunlight every day. So don’t put your garden on the shady side of the yard. Water–plants need water, and you don’t want to cart it around your yard. Be sure your garden will be reachable by hose, or near existing irrigation. Space–the garden will be no more than 4 feet deep, but can be as long as you choose. Leave at least 3 feet between garden beds. Bigger is not always better! Start small and add a new garden beds every year. For the first year I suggest you build and plant no more than 48 square feet. That is equal to: three 4×4 beds, one 4×12 bed, one 2×24 bed. The easiest to build is a long rectangle with access on all four sides. If you have to build along a fence (with the LONG side against the fence), either build one narrow bed that is only 2 feet wide, or build several beds with spaces between each box. Here are four different ways to configure 32 square feet of garden. Each is set in the corner of a yard with a fence on both sides. The first plan is 4’x4′, and sets the garden away from one fence, leaving a 3 foot pathway on both sides and between the gardens. This 16’x2′ plan puts the garden right up against both fences. But since it cannot be accessed from the side, it can only be 2 feet wide. If it was any wider, there would be no way to reach the plants. 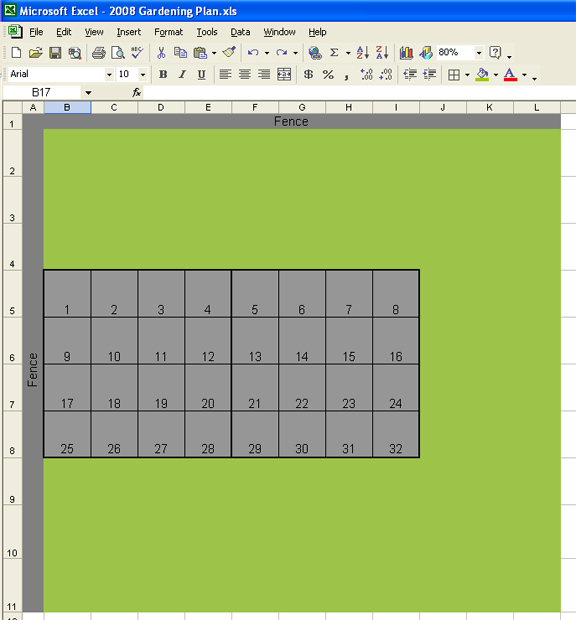 Next is an 8’x4′ plan. Notice it is 3 feet from the fence, giving access on 3 sides. Finally, here is a “T’ design. It takes up the most space in the yard, but is also very attractive. I have acquired a lot next to my house for a garden. It is 25’X165′. The back N. half is mostly shade but the front (south facing) has sun for about 6 hours. I was in a quandary on how to build a garden there until I found the Hugelkultur method on Youtube. My lot is bowl shaped and becomes a mosquito farm as it fills with water during the spring(drainage problem!). So using the hugelkultur method I can fill up the bowl and have a EW13’XNS20′ garden with a 1 1/2′ pathway down the center. So far I have cardboard down which I got from the local recycling center, Looking for logs and tree limbs around the neighborhood. The local tree recycling center allowed me to bring home some unshredded logs, have straw and potting soil ready and the local tree composting center will furnish leaf compost for my topping off the logs and cardboard. The logs will hold water and the plants will need less watering through our long, hot,dry summer here in Western KY. I use a Garden Planner Ap subscription on Mother Earth News, it is a great tool. This is my second year using it. I’m 74 y/o and an avid gardener in my retired years. Good luck to us all in our gardening endeavors this 2013 year! Last year we built 5 boxes 4 x 4′. I could not find a “vining” tomato so bought four that looked straggly and tied them up to webbing. This year I know “indeterminate” tomato plants are what I need but I can’t find the 7″ webbing described in my Square Garden Book. Not even the garden supply stores in our area have it. Any suggestions? The cat problem, I have put moth balls around the parimeter of my garden and flower beds, and it seems to keep the cats from getting in it at all. It is also good to keep small rodents away. (chipmunks, field mice even squirrels). Now you need to create a plan! Read all about it, and post it on my site if you are so inspired! My boxes are built, I have 2 4’x8′ that are spaced about 1.5’apart. But now I’m not sure what to plant where! Laurel–the SFG method should work perfectly in that planter box! Can I use SFG method in a 2’x4’x18″ planter box made of redwood? it’s on swivel casters- not in the ground. For those who find bending over, or getting up from a crouching position, difficult, try using cinder blocks for you SFG. I put them two blocks high, and find that I can sit on the blocks and get up. The blocks are heavy, but can be moved if you are not happy with the site. They will surely last as long as I need them (I’m 64). And, wow, the work of gardening is cut way down. I can sit on the blocks and pull any stray weeds. Since I have livestock (horses, chicken, sheep, rabbits), my soil is fertile! Thanks Emily, your site has been very helpful. Two years ago when I moved to GJ, I knew I wanted a garden. My landlady (a very nice person) said yes to putting in raised beds. The large yard is landscaped with a wide (6-8′) river rock border. I just moved the rock out of the way, put down 2 4×8′ and 1 4×4′ boxes and filled them with dirt (a CO Black Magic mix and peat moss). Last year I added an 8×12″ box. I’ve had 2 years of bountiful harvest, but I wasn’t using the SFG method! Now I am; found the book over the winter. 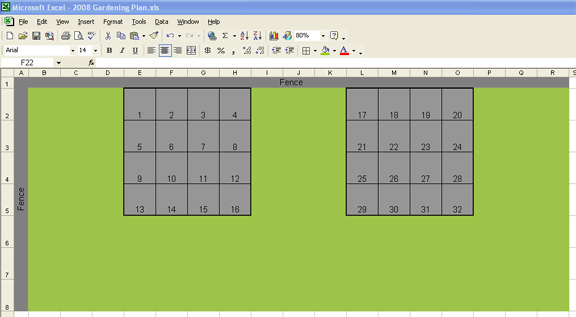 I’ve amended my soil with Mel’s Mix, laid out grids and planted most of what I’ll grow this year. Going to price out vertical support parts and pieces today. I’m thankful for the wide rock border because I’m able to have room around all 4 sides of the boxes (the boxes are not up against the fence). I’ll be able to walk behind the vertical supports to weave the plants thru the trellis as well as harvest the vegies. The best part is 3 of the boxes line up on the north side of the yard, against a solid white vinyl fence, facing south. Emily, your charts and links have helped me emensely with dates and products. Thank you so much. I built a 4×12 cinder block bed about 2′ deep. I’ll have 52 sq. ft. It’s built directly on the ground – I plan to use ‘black magic’ soil sold by the yard at the local garden center. Should I amend this soil? Also, what about drainage? Should I use gravel? Plywood with holes drilled in it. I would put some screen to cover the holes, so the soil stays in but the water can drain out. I am planning on building an elevated raised 4’x4′ bed. ( I need the height to avoid stooping over the garden) What is the best material for the base of an elevated bed and how does one achieve drainage with this method? I love your blog. It is the best I have found. I am ready to start my sq ft garden for the 3rd year. Thanks for the advise on building the soil and the soil testing kits. I spent a few weeks at a gardening seminar where the teacher–after years of planting and research–suggested that SFG won’t optimize plant growth since roots have been shown to grow much deeper than typically thought. Tomatoes, for instance, can grow 12 feet deep into the soil! His suggestion? Don’t put landscape fabric down before you add your soil if your SFG is on the ground. Mix your existing soil with the soil you add to your raised beds, and that way the plants will be much healthier. I have already done Mel’s SFG method for several years now, but my plants have never produced the quantity and quality that the teacher brought to show us all. I was amazingly impressed–going to take off my fabric and mix everything together in the spring and see if it helps. about keeping cats from using the garden as a cat box, If you don’t mind the cats in the garden just don’t want them doing their business there you can plant catnip. Cats wont go near things they would eat. The absolute cheapest way would be to do something like an Earth Box. You can find all sorts of homemade versions online. If you want to do the square foot method, building them out of wood is the easiest. I like using 2×10 or 2×12 boards, but you could go as small as 2×8 and still grow a pretty good garden. As for non-poisonous plants, I know you’d be safe growing lettuce, spinach, beets, mustard, and mint. Anything where you eat the entire plant. I’m guessing peas, beans, and carrots would be safe too, but you’d have to do more research to be sure. The daycare my kids attend wants to start a garden to encourage the kids to eat vegetables. We live in El Paso, TX. I think we are in the red color group. What’s the cheapest way for them to start a square foot garden and what can they plant this late in the season? Also, they can’t plant anything even remotely poisonous so that rules out tomatoes, potatoes and rhubarb. Thanks for all of this great information! You are such a blessing! We just finished building our (2) 4×4 boxes today and did the Mel’s Mix with a 1/3 vermiculite (which I found at Agway here in CT for $32 a 4 cu ft bag), 1/3 peat moss, and 1/3 compost (shrimp seaweed & cow manure based). It took some research to find the right stuff but I am glad we did. We had such a hard time calculating the 40 lb bags of compost and have more than we need but I filled my other garden beds with it so it worked out great. Now I am working on the layout and using some of your ideas for what to plant where….I want to grow cukes, peas, tomatoes & pumpkins but they are all vines and I don’t have enough room on any 4′ side for all of these. any suggestions? I was trying to keep them on the North side of the northern box with one trellis but feel like those 4 plants will crowd the whole side of that box. Should I not have those 4 all together in one box maybe? I have a friend with cats, and she had problems with this. She built a “cover” made of chicken-wire. Did the trick! Anybody else have comments on this? I’ve just laid out my sfg and am ready to plant. I’m concerned about how to keep cats from toileting in it? i used compost from a local landscape company. it was 25 dollars per cubic yard. it filled my raised bed that is 4 feet by 6 feet and and a foot deep. i had some left over to use in my potato bin. i just added a large bale of peat moss. i could not find vermiculite. the soil seems fine without it and seems to have the right amount of moisture retention. another bed of the same size was filled using bags of soil and compost from home depot and it was a lot more expensive than buying it by the cubic yard. See the section about building raised beds. In addition to wood (cheap) and vinyl (pretty), you can use railroad ties, cinder blocks, etc. It depends on your budget and preference. You can use premixed garden soil if you choose, I’m sure it will be fine. I would suggest you fertilize regularly, either with organic or chemical fertilizer. My first SFG. We are building raised beds off the ground due to having to set out fire ant bait in the yard and being concerned about runoff. What’s the best method for raising the beds and is it okay to use premixed garden soil rather than doing the Mel’s Mix which would be more time consuming and further delay our planting? This has all been really helpful! Thanks so much…I may be coming back with questions once I have planned my layout. I would worry that if the boxes are flat on the concrete it would not allow the soil to drain, and it would pool and drown the roots. I’m not sure if the rocks will improve this much. If it’s made of wood, I might try drilling some holes along the bottom of the box (every couple of feet) and covering the holes on the inside with screening. That way excess water has a way out, but the soil stays in. If you’re using vinyl, they probably aren’t flush to the ground so you don’t need to worry–it will drain. I live in Ft. Lauderdale and have my 4′ 8′ box build and it is sitting on a concrete deck. I was concerned about drainage and was not sure if plywood or rocks would be better. I filled the entire base of the box with decorative marble chips which are essentially rocks in bags from Home Depot. I have not yet added the growing medium as I was concerned the rocks might have been a mistake. Are the rocks too much drainage since the mix is so light? Please let me know your thoughts as I am ready to move forward this weekend. Thank you for putting your website together! It’s really helpful! Click here to see a raised planter box , a great option for those who can’t spend a lot of time bent over. To apply the SFG method to your barrels, you would use Mel’s Mix instead of dirt and follow the suggested plant spacing. I don’t know if the “square food garden” concept would work in my case, or how I should approach it. First, I am disabled so my moving around is somewhat limited. Second, my garden area consists of 13 half barrels. Can I do anything with that?? If so, how.